He’s one of the most polarizing figures in America, a football player who shows no fear in professing his religious beliefs. But more on him in a moment. First, I want to share a story with you, one it is hoped you will see the connection between it and the other subject of this chapter when you’re finished reading. At this point in the story, it would behoove me to tell you that this is a young lady who just “happened” upon my Facebook page in early November, after she googled “inspiration”, and which also came after series of events you’re about to read that, quite frankly, is unlike anything you may have read or seen before. As I sit here typing this, I’m still amazed she’s even alive. But before we get to that, here’s what happened next and how it all came about. About the time I received this message on Dec. 31st, 2011, I had underwent a series of personal events in the previous two months that had shaken my confidence and faith to the core. As a result, I returned to a practice I had begun sometime late in 2008, a time in which I had hit my own “rock bottom.” So in late December, I started every day with a prayer, asking Him for guidance and strength, even going so far that one morning I said “Look, I’m angry here. I need your help! Show yourself!” And then it “happened”…. I hope this helps you to understand a little bit more about my story. It will, no doubt, need to be edited down! While playing volleyball my senior year in high school I injured my back. I have had 4 failed back surgeries to date…hoping for no more. I lost my outlet, who I was. I belong on the softball field playing ball. That was taken from me due to my back injuries. I am frequently asked what does a perfect day in my life look like. My reply is stepping on the ball field with my dad. I lost both in such a short period of time. My dad was the most important man in my life, even after I married a wonderful man. My dad died May 9, 2000 while driving himself to the hospital after having a heart attack. He never made it. My heart was shattered, yet I took care of my mom and the 3 grandkids that they had custody of. I died inside, yet continued to be a wife, not a good one I may add, and a mother to a young son. I was present for our son but never 100% present for my husband. Though I grew up in an unhealthy home (my father was an alcoholic; however, after 3 DUIs he worked hard to become and remain sober the last 10 yrs of his life), he was everything to me…I was daddy’s little girl. He and my mother taught me well how to suppress my emotions within myself. I buried, and buried, and buried everything. I just kept shoving. That is all I knew. That’s all I saw. So that is what I was taught. I became a pro at it, so much so that it nearly killed me, not once, but twice. I tried to commit suicide two times in less than a month. On April 22, 2011, I intentionally took over 120 muscle relaxers. I was rushed to a trauma center, approx 42 miles from my home town, by ground ambulance. The helicopter couldn’t fly due to weather. I was in ICU for approx 24 hrs and was court ordered to the behavioral unit of that same hospital where I stayed for 5 days. I thought I was ready to go home. On May 19, I did the same thing; however, that time I took over 220 muscle relaxers. I wanted to die. I did not want to face another day of physical pain, emotional pain, of not being the mother that I felt my children needed and wanted, not being the wife my husband deserved. God had other plans. Once again, weather didn’t permit the helicopter to fly. I almost died. I was unresponsive, intubated and was in ICU in a different trauma center, again 42 miles away from my hometown. After regaining consciousness and breathing normally, I voluntarily went to that hospital’s behavioral center where I stayed there for 2 wks. I was not going to go home to die. I did not want to die at that point. I wanted my life back. I did not feel safe at the thought of walking out those doors so I stayed until I was confident in my safety plan and had counseling lined up. I would then put in 6 weeks of Intensive Outpatient for 3 hours a day 3 days a week at the same facility. While there, I met Nick. We grew very close, staying up until 4 in the morning just talking in the “common room.” He was released the day after I was. We continued our friendship by talking on the phone and/or texting daily and seeing each other occasionally. My sister Kim hung herself on Aug. 19, 2011. That happened to be her second attempt at suicide. The same sister, whom I just started having flashbacks in mid June of her molesting me while I was a young child. This is the same sister who handed her three children over to my mom and dad to raise. When my dad died, they were placed back in her care per my mom. That lasted about a year and a half. The oldest, a boy, had been molesting his two younger sisters while in their mother’s care. My husband and I took custody of my two nieces. They remained in our care receiving a safe, warm, loving home with stability, values and morals for almost 7 years. They decided life would be so much better living with Grandma (my mom). We allowed that to happen and transferred custody over to her. On the evening of Oct. 30, Nick told me that he was going to kill himself after an argument between us. I had once again set the boundary (something I never have to do or have had to do in the past) of him not texting me in the evening. That time was for my family. He had stopped taking his psych meds and was hearing the four voices in his head again. They never told him what to do or they never took over his body, they would just have conversations in his head. He would continuously text me so much so that it would upset my children and husband. I asked him how he was going to do it, and he told me medicine…pills. He told me this via text. I didn’t believe him. He promised me that he would never kill himself. He was in PBH (Parkview Behavioral Health) when I met him to get his meds regulated, not a suicide attempt. I called not one person. Not the police, not an ambulance, no one at all. I could have saved his life. I may not have known his address, but I knew the town he lived in and could have called the police in that town. Surely they knew him. I failed him horribly. I failed myself horribly yet again. After his death, I was headed right back to killing myself. The guilt and pain was more than I could bear. My husband stayed home for a week with me to make sure I wouldn’t do anything. I didn’t have to tell him how bad I was. I wasn’t getting out of bed, showering only when I had to, not eating…the classic signs of depression. While placing my safety plan in action, I distracted myself. One day in the first week of November I googled inspiration. I found your Gusto page and then your blog, gustoramblings.com. It took me 3 or 4 days to get through all your posts. After the first day of finding you, Thank God for you coming in to my life, I began to slowly lift my head up from being face down in the deep, dark hole of hopelessness, depression, guilt, anger, grief, loss, etc…I honestly believe I wouldn’t be here alive, today telling you my story and saying thank you over and over again if it weren’t for you and our Jesus Christ. Now back to Mr. Tebow. Although I didn’t get down on one knee like him and prayed to our Lord and Savior Jesus Christ, I’m convinced of its power, given the story you just read and the background leading up to it. So why am I including Tebow in all this? Here again, it’s another one of those “moments” that I prayed about today that finally compelled me to write this. So, feeling somewhat out of sorts today, I went for a walk and the thought occurred to me; why not see if I can incorporate his story with this young lady’s? No, they’re totally different I thought. Still, something was stirring in me. I read about a woman named Pam, who knows the pain of considering abortion. More than 24 years ago, she and her husband Bob were serving as missionaries to the Philippines and praying for a fifth child. Pam contracted amoebic dysentery, an infection of the intestine caused by a parasite found in contaminated food or drink. She went into a coma and was treated with strong antibiotics before they discovered she was pregnant. Doctors urged her to abort the baby for her own safety and told her that the medicines had caused irreversible damage to her baby. She refused the abortion and cited her Christian faith as the reason for her hope that her son would be born without the devastating disabilities physicians predicted. Pam said the doctors didn’t think of it as a life, they thought of it as a mass of fetal tissue. While pregnant, Pam nearly lost their baby four times but refused to consider abortion. She recalled making a pledge to God with her husband: If you will give us a son, we’ll name him Timothy and we’ll make him a preacher. Pam ultimately spent the last two months of her pregnancy in bed and eventually gave birth to a healthy baby boy August 14,1987. Pam’s youngest son is indeed a preacher. He preaches in prisons, makes hospital visits, and serves with his father’s ministry in the Philippines. He also plays football. Pam’s son is Tim Tebow. The University of Florida’s star quarterback became the first sophomore in history to win college football’s highest award, the Heisman Trophy. His current role as quarterback of the Denver Broncos has provided an incredible platform for Christian witness. As a result, he is being called The Mile-High Messiah. Tim’s notoriety and the family’s inspiring story have given Pam numerous opportunities to speak on behalf of women’s centers across the country. Pam Tebow believes that every little baby you save matters. I pray her tribe will increase! May the peace of our Lord Jesus Christ be with you always! 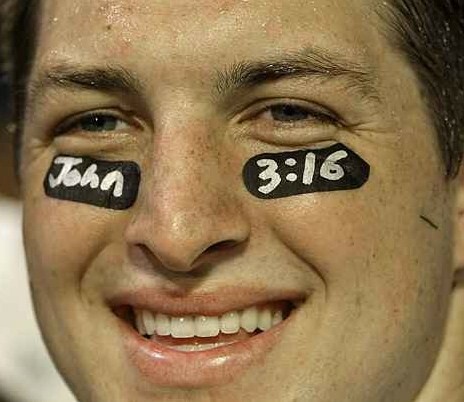 Whether Tim Tebow ever wins another football game in his life is irrelevant. And regardless of your particular spiritual belief, his “presence” among us does at least ONE thing. It gets us to thinking and asking ourselves these questions: Can it be? Is it possible? Is God really at work here? We can argue all day, we can say “Well, this is all just coincidence.” That’s hogwash. Nothing, absolutely nothing, just “happens” by mistake in this world. I’m absolutely convinced of it! Mr. Tebow’s passing statistics from yesterday’s playoff against the Steelers? TEN completions, 316 yards, average gain of 31.6 yards per completion. His trademark eye black he’s had since college? John 3:16. Think about it. WOW! I AM SO HAPPY TO READ THIS. IT IS SUCH AN INSPIRATION! I LOVE TO WATCH TIM TEBOW PLAY AND THANK HIM FOR BEING SUCH AN INSPIRATION AND ROLE MODEL. HE IS ONE GREAT CHRISTIAN AND GREAT FOOTBALL PLAYER! JUST WISH WE HAD MORE LIKE HIM. What a wonderful witness story. And it's not just coincidence, it happens, God is at work in our lives all we have to do is slow down long enough to realize it and know He weaves all our lives together for the better.Believing in Him changes everything for us. Beautiful story (or stories). Amazing how it all comes together sometimes. I have noticed so many "coincidences" & signs over the past year, since I've been blogging, meditating & becoming more aware spiritually. I, too, believe there are no "coincidences." Rather everything happens for a reason, people pass thru our life as messengers & teachers at the right time, whether positive or negative. There is truly value in ALL experiences & they all tie together in the great mysterious wondrous web of life. Thanks for sharing Gusto! This is truly awe inspiring. It makes me realize that God has a purpose and plan for our lives, no matter what we go through. I am so happy to have discovered your page. It inspires me daily.